This isn't the result of a real joseki, but a kind of standard of comparison. How is this result to be evaluated, given that White had first play here? The stones mean that White has a good base for each group. 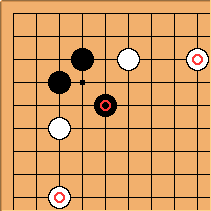 The stone means that Black has escaped into the centre, as well as taking the corner. From the point of view of the whole board position, White's two well-developed groups are the most important feature. In the global picture, getting established on both sides should outweigh Black's corner profit and sente. 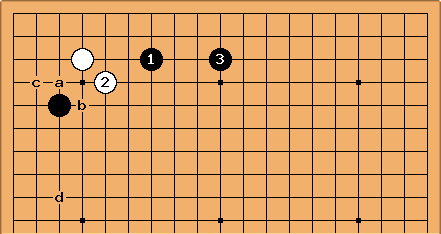 There are many joseki variations with comparable results, especially with the 3-5 point pincers. In those one expects to find that one of the two side groups is weaker than in the diagram. Allowing the opponent good development on both sides isn't really an acceptable result in joseki. 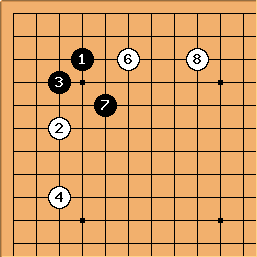 The player taking the corner is interested in making the pincer (or double kakari) here look like an overplay. The purpose of here probably is to develop on both sides. White must now consider carefully whether playing White a, Black b, White c is good enough. If not, a pincer in the direction of d must be thought about.